2. What do you have to do to become a SAY ref in Loveland? Take the SAY ref classes – offered at the start of each season. Fall is in mid to late August & Spring is in mid to late March. 3. How will I know when & where they the classes are held? Contact the ref coordinator by e-mail. 9. Is there a second class & test to ref the older age groups? Yes. The first class is to ref Instructional & Passers. There is another class (not offered every season) to cover the additional rules for the Wings & older brackets. 10. Do I have to take both classes if I only want to ref the older kids? No. The same material is covered in the older age bracket class. There are just additional rules covered. 12. What do I have to buy to be a ref? 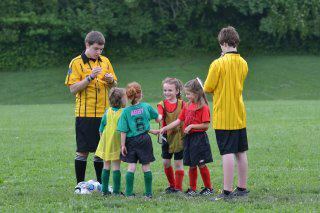 You have to buy a referee shirt, any solid black shorts or pants, referee socks, whistle, and stop watch. 19. How many ref classes are given before the season starts? There is 1 ref class in Loveland, but other SAY districts also give classes.